Pan-roasting mussels will concentrate their delicious flavor. It is as easy as tossing clean mussels in a very hot pan. Mussels are a sustainable shellfish you can find in many areas of the U.S. and around the world. They are usually a farmed shellfish, and different varieties have different seasons. Mussel farms are good for the coastal environment as mussels filter a dozen gallons of seawater each day. Mussels are often farmed on ropes, and so they have less debris inside them than wild mussels growing on the sea floor. Farmed mussels usually have done most of the purging needed before you buy them, while wild mussels will need to be soaked in clean water, so they spit out debris. Farmed mussels will also have cleaner shells and won't need as much scrubbing as wild mussels. 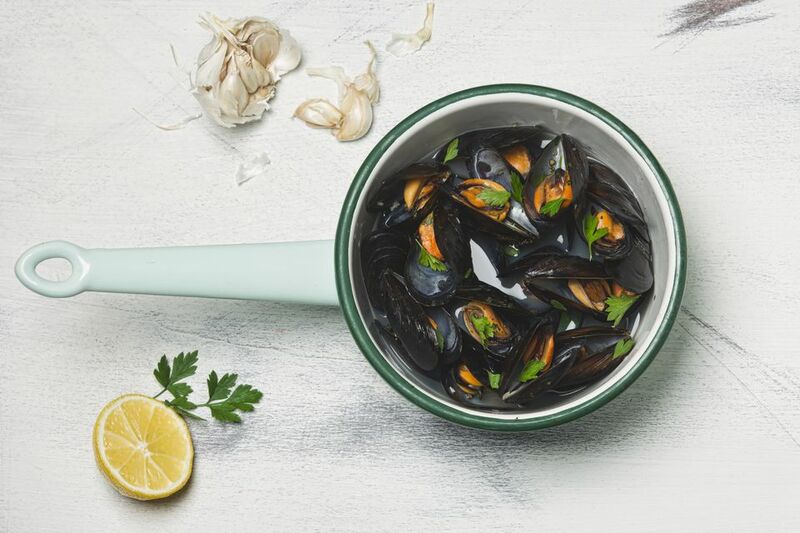 Fresh mussels can be kept for 4 to 5 days in the refrigerator in a bowl covered loosely with a paper towel. Because they are perishable, you may not be able to find them far inland from where they are cultivated. Allow about 1/2 pound of mussels per person for an appetizer and about 2 pounds per person for the main course. You can expect that some of the mussels will have to be discarded, so buying more is usually a good plan. First, rinse your mussels in a colander with cold water. Use a brush to clean off seaweed and mud. Now you'll need to debeard them, removing the membrane that extends from the mouth of the shell to attach them to rocks. These may already have been removed for farmed mussels, but there may be some that haven't. Grasp the beard with your thumb and forefinger and pull firmly downward towards the hinged end of the shell. Check for dead mussels by taking any that are gaping open and tapping them a few times. Live mussels will wake up and close their shells. Toss any that remain open after a few attempts. Dead mussels go bad very fast, and you don't want to be exposed to the bacteria that will be growing in them. Heat a cast-iron skillet or other large, heavy frying pan over high heat until very hot. Add only as many clean, picked-over mussels as fit in the pan in a single layer (be sure to throw away any mussels that don't close tightly when you tap on them). Sprinkle the mussels with salt and freshly ground black pepper, if you like and cook, stirring now and again, until the mussels open, usually within 5 minutes or so. Use tongs to remove mussels as they open to avoid over-cooking them. You may need to cook the mussels in batches. Discard any mussels that do not open when cooked. Serve the mussels hot. Sprinkle them with chopped flat-leaf parsley, if you like.